Congratulations to bn100, winner of the tour prize and to BooksChatter, the host winner. 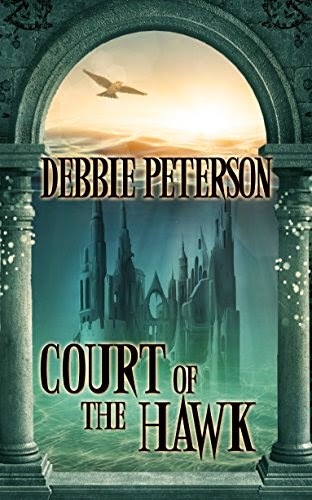 Goddess Fish Promotions is organizing a Virtual Name Before the Masses Tour for Court of the Hawk by Debbie Peterson, a Fantasy/Paranormal Romance available now from The Wild Rose Press. The tour will run every Tuesday for 12 weeks starting on June 16, 2015, and Debbie is available for guest post and interviews. A PDF copy of the book is available for review in conjunction with a guest post or interview. Debbie will be awarding $15 Amazon or B/N GC to a randomly drawn winner via rafflecopter during the tour, and an ebook copy of Spirit of the Rebellion to a randomly drawn host. The Reading Addict can host 7/28, guest post, please. BooksChatter can host 7 July. Q&A please. June 16, please and thanks! For a guest post topic, I'd love any "Fun Facts/Behind the Scenes/ Did You Know? "-type info about either the book itself or the writing process of the book! I'd like to host on 7/14 with an interview at Reviews and Interviews. thanks! A Novel Kind of Bliss can host a guest post (topic open to author) and review on September 8th. Thanks! Guest post (creating main character or authors choice) on July 21st. I can host on August 4. Guest post topic is: What is the best and most rewarding thing you find about being a writer? Want to share what you think is the worst and most frustrating thing you find about being a writer? We would love to review for 11th August.